Source: Holista CollTech Ltd / Holista Foods Inc.
Perth, Kuala Lumpur and Ontario, Feb 14, 2018 - (ACN Newswire) - Holista CollTech Ltd ("Holista")(ASX: HCT) is pleased to announce group company Holista Foods Inc. ("HolistaFoods") has signed a 3-year MoU to supply its patented low glycemic index ("GI") mix to Wing's Group, North America's leading noodle supplier. Pursuant to the MoU, sales are expected to be US$6 million for the 2018 financial year. This is projected to increase to US$12 million in 2019 and to US$25 million in 2020. The MoU with Ontario-based Wing's is the first order for Holista which seeks to address obesity and diabetes-related health issues worldwide with this technology offering. According to the Center for Disease Control and Prevention, over 100 million adult Americans suffer from diabetes or pre-diabetes. The sales order marks HolistaFoods' entry into the billion-dollar global noodle market. According to Grand View Research, the global pasta and noodles market size was valued at USD 59.6 billion in 2016 and is expected to grow at a compounded annual rate of 3.6%. The U.S. noodle market alone is worth US$270 million, the world's sixth largest market for instant noodles. In 2016, the World Instant Noodles Association reported 97.5 billion servings consumed around the world. Noodles account for half the world's supply of wheat compared to 25% for bread. Developed by HolistaFoods Buffalo, the New York-based arm of Holista Foods Inc., and supported by Diabetes Canada, the patented formula recorded a GI reading of 38 in independent tests by Glycemic Index Laboratories, Inc., well below the global average of 60. The reading indicates the rate in which foods containing carbohydrates raise human blood sugar levels, with a lower score indicating healthier food. 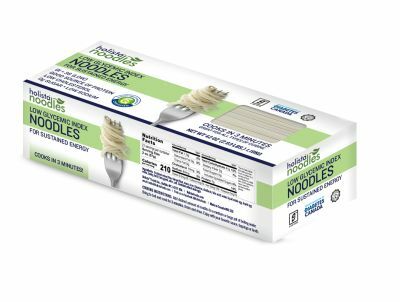 The noodles are endorsed by the Glycemic Index Foundation and follow the guidelines and recommendations of Diabetes Canada. An 85-gram serving of noodles contains 11 grams of protein, three grams of fibre, zero sugar while being low sodium and cholesterol and provides sustained energy. The noodles cook in just three minutes. HolistaFoods formula comprises extracts of okra (ladies' fingers), lentils, barley and fenugreek - clean label ingredients - all natural, with no artificial ingredients or preservatives. This has successfully tested low-GI formulas for bread and muffins, and is now working on mixes for pasta and pancakes. A key feature is that the mix can be prepared easily, with no discernible change in taste or texture of the finished product. The order from Wing's is expected to have a significant impact on Holista's revenue from the financial year ending 31 December 2018. Neal Lee, President of Wing's, said: "Diabetes is becoming a global pandemic that threatens lives and increases healthcare costs. Wing's is proud to be the first major noodle manufacturer in the world to launch a dedicated low-GI noodle. We are confident that our partnership with Holista will be well-received in North America, if not globally." Nadja Piatka, CEO of Holista Foods, said: "The North American noodle market is sizeable and significant, and we believe this collaboration with Wing's can set the trend for global acceptance of a healthy version of instant noodles without compromising taste or texture. We are grateful to Wing's for this partnership." Dr Rajen Manicka, Chairman and CEO of Holista, said: "Our MoU with Wing's is significant as it marks our entry into the global noodle market with a low-GI product that is both healthy and affordable. We are confident that this market validation will also enable us to gain greater acceptance in Asia, especially in the leading noodle markets of China and Indonesia. We now want to make a push in the lucrative instant noodle market." Holista CollTech Ltd ("Holista") is a research-driven biotech company and is the result of the merger of Holista Biotech Sdn Bhd and CollTech Australia Ltd. Headquartered in Perth with extensive operations in Malaysia, Holista is dedicated to delivering first-class natural ingredients and wellness products and leads in research on herbs and food ingredients.